literally means “at the head of the tracks”; a gate being a way, track or road. however, there was also a Stone Circle at Beacon Lough. who were named after their Celtic goddess Brigantia. such she was associated with the Beltane Festival, often thought of as the “Fire Festival”. Britain take on a new meaning. a circular churchyard ... symbolic of the Celtic Sacred Grove. Washington Village, Tyne - Wear, England. The area upon which Washington Village now stands was an important Celtic religious centre. 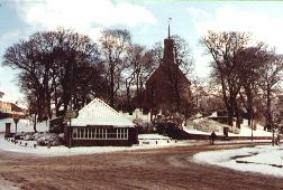 The Village Green covers the area where the Village Pond was situated. instability was more likely caused by subsidence as a result of coal mining in the area. was impressed by the new structure however, and it soon came to be called "The Barn". 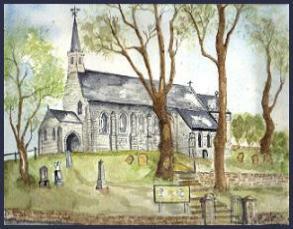 How beautiful the Norman Church must have been in comparison! It wasn't until 1882 that the first improvements were made. 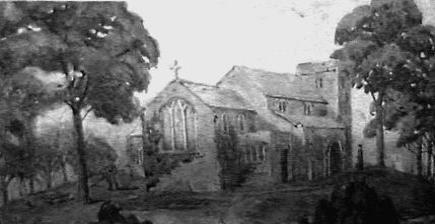 pounds in 1833, was disparagingly called "The Barn"
Improvements to the modern building were carried out in three main stages. undertaken. The nave was made longer, the trancepts were built on and the roof was made higher. 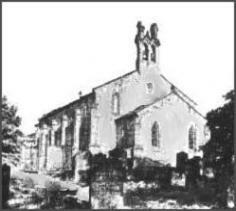 Stage Two: 1902 The chancel was made longer and a vestry was added on. Stage Three: 1962 The old bell tower was taken down and replaced with a less elegant new one. tower, is clearly visible on this old photograph. Hilton, Pattinson, Brack and Sanderson families. into the orchards to the east of the Old Hall. of the "Church on the Hill". As time went by the cemetery was enlarged. Sadly many of the grave stones have been vandalized. the entrance would be located directly opposite the sand pit. This is the most recent part of the cemetery. It has a serenity all of its own. of years into the mists of history. Link to "Washington, Tyne-Wear, England"
Link to "Washington Old Hall"
Link to "Bryan Ferry: A Washington Lad"
to be the centre of the universe. the Holy Trinity Church now stands) as the centre of the universe. Holy Trinity Church at Washington Village was no exception. Age of Gemini, and its subsequent rising in the Age of Taurus. a Celtic Lake Village in this area ... not unlike the one at Glastonbury. Saint Brigit, was the "fire goddess"
Sunderland Museum, is not unlike these ones. the symbolic centre of the Celtic Universe.. 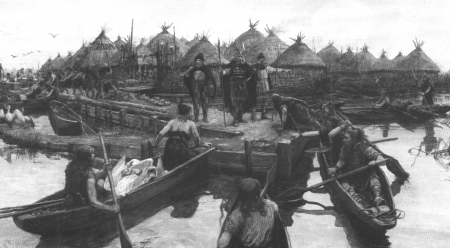 This is A. Forestier's impression of what Glastonbury Lake Village may have looked like (1911). Perhaps if one looks hard enough, evidence may be found of a similar Celtic Village in Washington. 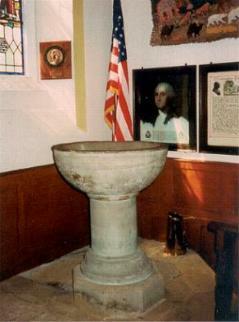 of Washington were baptized 1183-1376.
distinctive in that they were surrounded by a circular churchyard. of Durham in that year. the Manor and Village of Wessynton, excluding the church and its lands. hundred years on the crest of the hill in Washington Village. 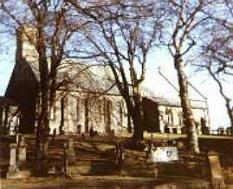 by a circular church yard took on the role of the Sacred Grove. 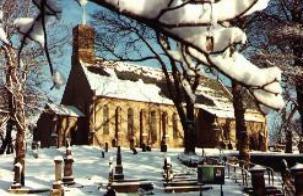 by a circular church yard … symbolic of the Celtic Sacred Grove. 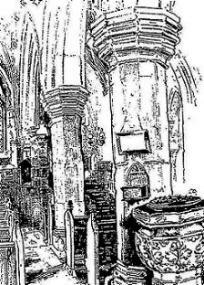 in the South Aisle may have looked. the old Lords of Washington. arches; one is new sashed: The east window consists of three lights under a pointed arch. 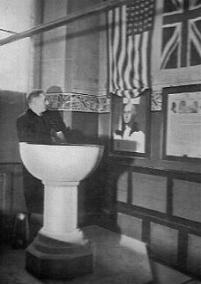 Mr. Talbot, afterwards Bishop of Durham. On a brass plate fixed in a blue stone, within the rails of the altar, in old characters. A view of the east window and the north porch. 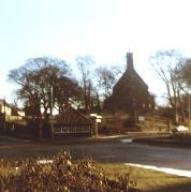 In the background is very possibly what is now “The Washington Arms”. at the entrance to the nave, the grave cover of Alexander de Biddick and the font. cross: Hic jacet Jacobus Sanderson”. 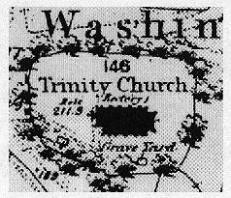 * "Church-yard" refers to Washington church yard. that he had been away at The Crusades or even that he was a Knights Templar. Large Folio Volume of tipped in engravings and sketches. Surtees in the History of Durham. architecture, but so far no confirmation has been discovered. Church … and in these vaults lay the Tombs of the Washington Family. Trinity Church? I would like to think that do, but I suspect that they don’t.